In both places, local people have been deprived of autonomy, and they face a severe public health crisis as a result. The American public has been shocked to discover that the people of Flint, including children, have been being poisoned with lead by their municipal water supply since April of 2014. The questions of who took the decision to draw water from the heavily polluted Flint River, and why, have been fiercely debated in recent months. But one thing seems clear. The Flint public was deprived of an effective voice and had difficulty being heard. In essence, Flint’s population was under colonial rule because its local democratic institutions were sidelined by the state. For similar reasons, the population of Gaza, under Israeli occupation and blockade, is facing a severe water crisis. In both places, local people have been deprived of autonomy, and they face a severe public-health crisis as a result. Michigan has become more and more immune to public input. The state once had a Michigan Water Resources Commission, a Michigan Toxic Substance Control Commission, and a Michigan Environmental Review Board. A Republican governor established the latter in the 1970s to ensure that there would be “a public forum where citizens had standing without hiring a lawyer.” In the 1980s and 1990s Governors James Blanchard and John Engler gutted those commissions and the MERB. Other than the rich, Michiganders lost standing. Then when Governor Rick Snyder came into office, he split the Department of Natural Resources from the Department of Environmental Quality, which had the effect of making the latter more technocratic and less open to public feedback. He also immediately reduced their total funding by nearly 11 percent, telegraphing his lack of interest in things like state water quality. As a matter of political philosophy, the MDEQ was pervaded by a dislike of regulation, so that department officials took a minimalist approach to water purity and disputed any challenge to their consensus that Flint water was just fine. The Michigan Republican Party in 2011 passed the notorious Emergency Manager Law, which allowed the governor effectively to seize control of municipal governments and school boards with budget over-runs, and to appoint an outsider with a charge to impose austerity and fiscal discipline. Michiganders, outraged, struck the law down by a referendum vote in 2012. The Republican majority in the state legislation reinstated the law and forbade further referendum challenges. Critics charged that the law was implemented in a racially invidious manner. By 2013 half of the state’s African-American population was being ruled by the governor’s appointed viceroys. Moreover, the conviction of the emergency managers that there was enough money in some of these communities to provide the governance necessary to residents’ well-being, if only it was properly managed, was misplaced. Austerity is not always compatible with effective police, fire departments, and public health. Snyder’s appointment of a series of emergency managers for Flint took many important decisions out of the hands of local government. While mayors and city councils still existed, they were inclined to go along with EM decisions (their votes were merely symbolic, in any case, since the governor had castrated them politically). And, of course, the EMs themselves answered to the governor’s office. Indeed, at some point in the process of switching from the Detroit Water and Sewage Department-provided water to the Flint River for the city’s water supply, Emergency Manager Ed Kurtz was advised by the MDEQ not to resort to the highly polluted river, and very possibly was over-ruled on this issue by Governor Snyder himself. Local voters, who had had their franchise stolen from them, were incredulous at the idea of drinking Flint River water, having watched GM and other industries dump toxic pollutants into it for decades. But Flint is not a city full of wealthy people, and the cost of drinking only bottled water drove many to make their peace with the foul-smelling tap water. They lost hair, developed rashes, and experienced other obvious symptoms of lead poisoning, and raised these concerns with officials. The emergency managers and the governor turned a deaf ear. It did not help that MDEQ staffers did not insist on the corrosive water’s being treated before being put into ancient lead pipes, and later did a shockingly poor job of testing the water. In spring of 2015, a year into one of the great public-health debacles in American history, the Flint City Council staged a symbolic protest vote in favor of abandoning Flint River water and spending $12 million a year to reconnect with the Detroit Water and Sewage Department. The emergency manager dismissed the demand as incomprehensible. The city council was powerless. Only when physicians and scientists like Dr. Mona Hanna-Attisha went public was the governor finally forced to acknowledge the crisis and begin taking steps to address it. It is clear that both the initial decision making and the subsequent studied dismissal of public and expert concerns derived from a form of colonial government. Flint was being run from Lansing, for the priorities of a Republican governor and legislature suspicious of regulation and convinced that government should be small and inexpensive. They also believe that elected municipal officials (apparently especially if in minority-dominated cities) need oversight because of an innate tendency to irresponsibility. Just as Flint residents were disenfranchised by the Emergency Manager Law and had their access to a basic staple like clean water denied by decisions made by bureaucrats they did not elect, so the Palestinians of Gaza lack the basic rights of citizenship. Israel invaded Gaza and ruled it directly from 1967 to 2005. It still prevents Palestinians from farming one-third of its land, denies it a seaport and an airport, and closely controls building and other materials going into the surrounded territory. Palestinians do not control their land, their water, or the air over their heads. Since 2007, the people of Gaza have been under siege by the Israeli government, which is recognized as the occupation power. The Geneva Convention on the treatment of occupied populations of 1949 were enacted to forestall further crimes of the sort the Axis powers committed in the places they occupied during World War II. The convention makes occupying powers responsible for the health and well-being of the peoples they dominate. The Israeli government’s fiction that it withdrew from Gaza in 2005, and may now treat the small strip and its trapped population as a belligerent independent state, has been repeatedly rejected by the international community. Israel is responsible for the Palestinians of Gaza. The residents of Gaza would immediately recognize and empathize with the woes of the people of Flint. Over 90 percent of the water in the Strip is undrinkable. Umm Ibrahim Amna Abdel’al complained to RT, “We can’t drink it, cook with it, or wash in the kitchen with it…. We are forced to buy all the clean water separately.” The Israeli assaults, with massive aerial bombardments, of 2008-9 and 2014, did extensive damage to sewage and water pipes and other water infrastructure. In the 2014 Israeli assault, about 12 percent of Gaza’s wells were damaged or ruined in Gaza City, Beit Hanoun, and Deir al-Balah. Some 33,000 meters of water and sewage networks were damaged in Khan Younis and 6300 meters in Gaza City. Raw sewage was unleashed by Israeli bombs onto farmland and into pools and the sea. Broken drinking-water pipes are susceptible to its contamination. Power is often not available to pump water and run the sewage-treatment plants. Israeli restrictions on import of materials necessary to reconstruction have interfered with building and infrastructure repairs. Pipes are so damaged and leaky that even when Israel tried to send in extra water last spring, in accordance with its obligations under the Oslo Accords, the Palestinian water system was unable efficiently to deliver it to residents. Salt water is seeping into the water supply, as are nitrates. Nitrate contamination poses a special danger to pregnant women and infants and produces “blue baby syndrome,” interfering with the ability of the child’s blood to carry oxygen. Sodium in water can cause nausea, vomiting, convulsions, and cerebral and pulmonary edema (water on the brain or in the lungs), and can aggravate congestive hear failure in adults. In infants with gastrointestinal infections, whose kidneys do not flush the sodium so effectively from the body, it can cause permanent neurological damage. 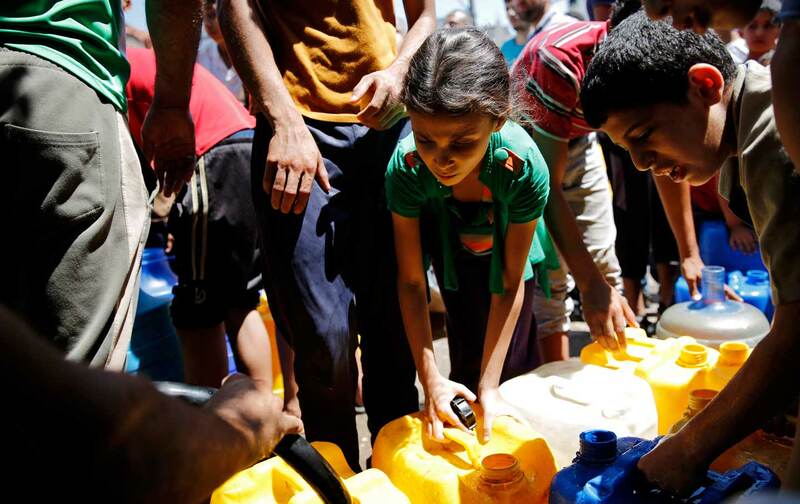 A UN agency concluded last fall that Gaza, with 1.8 million inhabitants, could be uninhabitable by 2020, in part because of lack of potable water. Were the Palestinians to be forced out of their homes yet again (a majority of families in the Strip were expelled from what is now Israel by Zionist forces in the 1948 war), they certainly would join the tragic stream of refugees heading for Europe over the treacherous Mediterranean. Israeli complaints that Gaza is controlled by the party-militia, Hamas, freely elected in 2006, and that Hamas fires (mostly small, home-made and ineffectual) rockets into Israel, are irrelevant to the requirement that civilian noncombatants in Gaza be provided with basic staples by the occupying authority. Israel has a right to defend itself against Hamas militants, but may not do so with reckless disregard for noncombatant life. The international law of occupation requires that, “To the fullest extent of the means available to it, the occupying power must ensure sufficient hygiene and public health standards, as well as the provision of food and medical care to the population under occupation.” Half of the population of Gaza is children, who are not exactly members of or decision-makers in Hamas. The problem for Palestinians is that they are stateless. A people with a state would have a port through which to import reconstruction material. It would have the sovereignty to operate that port. It could set its own development agenda. Its complaints would be heard by local officials capable of acting, whose hands were not tied by distant decision-makers in Tel Aviv. Both in Flint and in Gaza, people are suffering from lack of clean water. In both places, the ultimate crisis is a crisis of democracy and full citizenship. Emergency managers appointed from a distant capital are no more cognizant of local conditions or responsive to popular complaints than are military governors of an occupying Power. Water is too necessary and human life too precious to allow them to be subordinated to other considerations, of abstract political philosophy or forms of exclusive ethnic nationalism. All human beings have a right to clean, free water. Leaders not only fail but discredit themselves when they do not provide a framework allowing the achievement of that goal.